As per Jay Samit, Independent Vice Chairman at Deloitte & bestselling author, over 3 million people in the United States quit their job last month. That must have spurred some thought. He posted some numbers that would shock you. 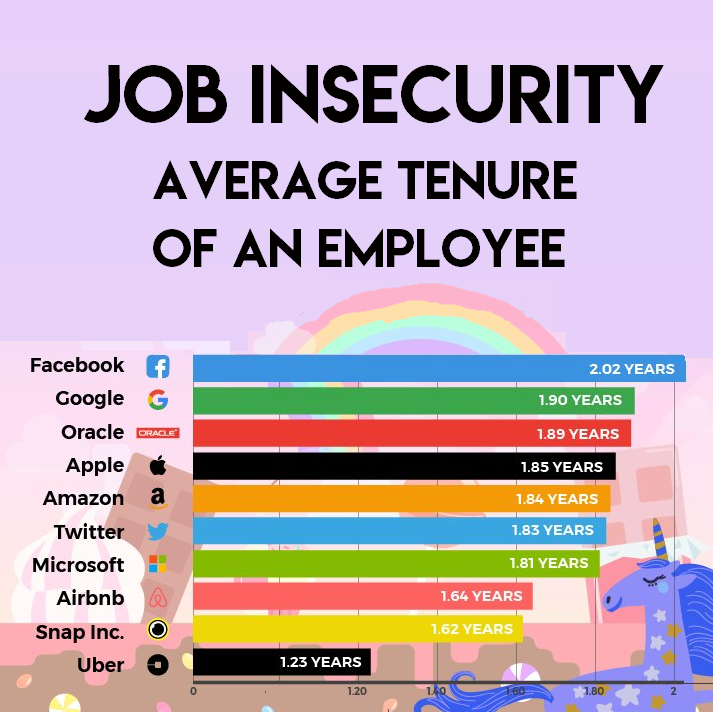 What you are seeing is the average tenure at some of the world's leading tech companies. The numbers are astounding. The average employee at Facebook is only there for 2.02 years. That is the highest number you see here. When I was a younger people got jobs and were concerned about upward mobility within the same company. As well, they stayed at that company for almost their entire career. The age of working at a single company died a long time ago. Then the average duration at a company was 10 years, then 5. Now we are looking at tenure equivalent to a long-term consultant. When you really get down to it, the new model could very well be to outsource everything and only keep certain, core functions internal and most likely with the founders. The new age arrived and people never saw it coming, including the traditional HR departments. There is still a separation between what reality is and what HR is using as a measuring stick. They are still asking "Why were you there for such a short time" or "Why do you jump from job to job?". Most are asking that question without knowing their own tenure metrics. More importantly, most people are put in a panic about their careers when they realize their average tenure at a given employer may not be what HR departments are seeking. It is our opinion they have to be able to speak about the skills honed and skills learned while at a given employer. How they have put those skills to good use while at employers and not on how long they were at a given employer. This is especially key for career consultants that are moving from gig to gig in 6 to 12-month stints. Take control of your career and learn to market yourself and what you bring to the table. Know your worth and demonstrate it to others.